Read below the headline, and reports describe a protein-filled assault on the Kiwi Cafe, as protesters rained grilled meat and fish upon diners, then lit up post-meal cigarettes. The mode of attack recalls The Butcher, one of the villains tormenting Wordgirl in her quest to spread civility and erudition. Not much on symbolism, The Butcher deploys a flood of sausage and chops to bury Wordgirl–although, this being PBS, the hero always wins. Reports from Tbilisi, however, suggest that the protesters were griping about more than the standard restaurant policy requiring diners to buy rather than bring their own food. 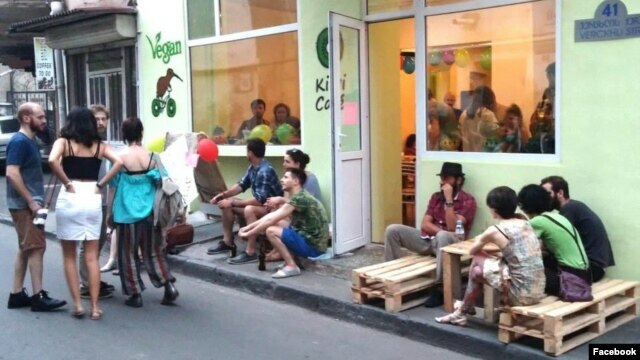 Apparently the cafe had become a congenial hangout for denizens of a Georgian counterculture, including LGBT people. Throwing meat was an assertion of some vision of a traditional Georgia culture, intended to create discomfort and provoke confrontation. But the protesters left the meal early, before police arrived. The protest in Georgia using food to isolate and stigmatize opponents is, alas, not an isolated incident. Most recently, local governments controlled by the National Front in France have mandated that the meals they serve school children will include pork, explicitly forbidding accommodations for Muslims or Jews–or, presumably, vegans. The meals served are far more sophisticated and substantial than in American public schools, and the French lunch ladies emphasize that they won’t force children to eat food they don’t like. The point the National Front is making, however, is that those who won’t adopt its vision of French culture don’t belong in France. Focusing on school lunches is harsh and cruel and makes exactly the politics and images that the party wants. It’s also not new: More than a decade ago, nationalists began serving “identity soup“–with red wine–to all comers on the streets of Paris. The stew, larded with every conceivable part of the pig, promoted as a gesture of generosity and welcome, was exactly the opposite. Prohibited by French laws that ban activity that incite racial hatred, the disobedient demonstration surrounding the cauldron was all about showing who wasn’t welcome. “We are all pig eaters,” the diners chanted, between slurps of stew. Deploying a cuisine is a way of asserting and imposing identity, and provoking reactions and conflict. Again, this is nothing new. Before the miracle of oil lasting eight days, the Chanukah story begins with Antiochus, a Hellenistic king of the Eleucid Empire, ordering pigs to be sacrificed–and eaten–on the steps of the Second Temple in Jerusalem. More than 2,000 years later, observant Jews at Christmastime celebrate the successful rebellion of religious zealots by lighting candles, spinning dreidels, and eating fried food–and no pork. *Thanks to Erin Evans for the tip. This entry was posted in Uncategorized and tagged Antiochus, Chanukah, counterculture, dreidel, food, France, Georgia, identity, LGBT, lunch, National Front, Paris, race, school, stew, Tbilisi, The Butcher, vegan, Wordgirl. Bookmark the permalink.